Visuano'e, sabu ahe ohu'o dahoru'e. Teeth of the river fish, spots of the wood-boring grub and Ömie mountains. The lines that run through the work are known as orriseege or 'pathways' and provide a compositional framework for the designs. The arches are dahoru'e, the design of the Ömie mountians. The chevrons are visuano'e, the teeth of the river fish. 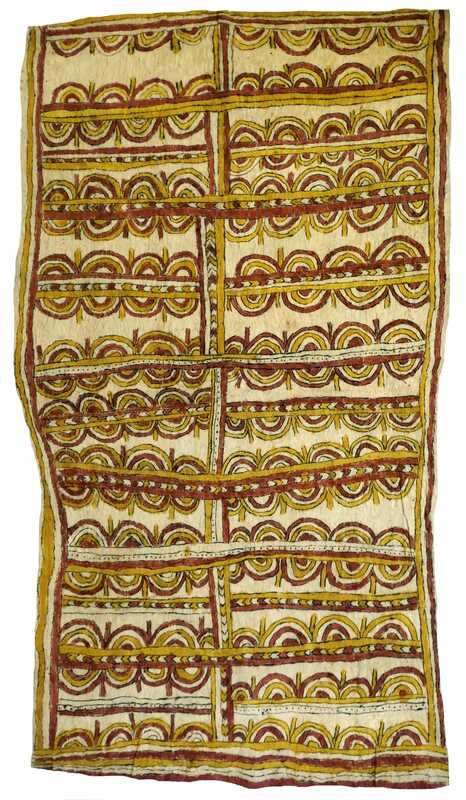 The spots that have also been incorporated into this design are sabu ahe representing the spots which can be seen on the sidesof a wood-boring grub. This grub is scared to Ömie people as it plays an important part within the creation story of how Huvaimo (Mt Lamington) came to be volcanic. It is a traditional sor'e (tattoo design) which was most commonly tattooed running in one line under both eyes.